Dr. Ted Fon (left), Chair, Parkinson Society Canada’s Scientific Advisory Board and Chair, Donald Calne Selection Committee presents Dr. Andres Lozano with the Donald Calne Award in Ottawa. 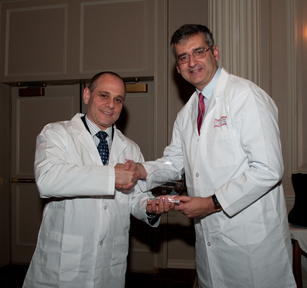 Dr. Andres Lozano, distinguished neurosurgeon, professor and RR Tasker Chair in Functional Neurosurgery at the University of Toronto addressed over 120 attendees at the Donald Calne Lecture hosted by Parkinson Society Canada and Parkinson Society Ottawa, on Sunday, May 16th in Ottawa at the Fairmont Chateau Laurier. Dr. Lozano, who was the first surgeon in North America to perform deep brain stimulation (DBS) surgery, brought his audience up to date on advances in DBS, the breakthrough surgery that has improved quality of life for many people with Parkinson’s. He also provided an overview of novel surgical approaches being tried, including: transplantation of dopamine-producing cells into the brain; stem cell therapy; gene therapy and trophic factors therapy. He said that, even more experimentally, researchers are looking into spinal cord stimulation and using new techniques such as shining a special light into the brain to activate or silence neurons. “As we travel from one site to another, we are able to stop and listen to the language of the brain and we are able to see that the neurons fire with different patterns. Just as when you travel from country to country in Europe, going from Spain to Portugal, from France to Italy, over the course of time, we can tell where we are and we can understand the language of the brain, making surgery safer and more successful,” he added. Attending the Donald Calne Lecture in Ottawa are (left to right): Dr. Ted Fon, Chair, Parkinson Society Canada’s Scientific Advisory Board and Chair, Donald Calne Lecture Selection Committee; Bruce Ireland, Chair, Parkinson Society Canada Board of Directors; Dennise Taylor-Gilhen, Executive Director, Parkinson Society Ottawa; Dr. Andres Lozano, recipient, Donald Calne Lecture; W. P. Bruce Good, Vice President, Partnerships and Communications, Rx&D, sponsor of the event; Joyce Gordon, President & CEO, Parkinson Society Canada. Every time a tremor cell fires in the brain, it causes a tremor. If neuroscientists can put an electrode in the middle of the brain and turn on electricity through the electrode in the cells in the brain, they can control the tremor. Lozano noted more research is needed into this and other aspects of Parkinson’s. “We’ve become good at treating tremor, rigidity and slow movement. We’re not good at treating the non-motor aspects of Parkinson’s, such as depression, posture, cognition, sleep, olfaction (sense of smell), sexual dysfunction and speech.” These are areas for future investigation. Our thanks to Rx&D who sponsored this year’s Donald Calne Lecture. 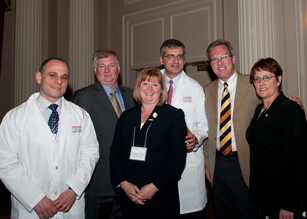 The Donald Calne Lecture was recorded and is available on Parkinson Society Canada’s website.